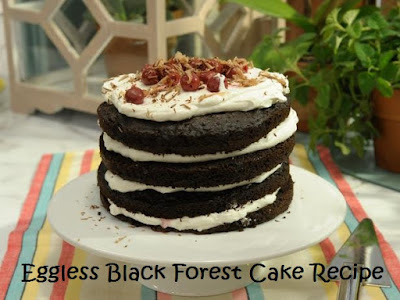 You can make tempting black forest cake with two to three layers of whipped cream and chocolate to celebrate any occasion. For frosting you can use ready made whipped cream or make it at your home very easily. For making the frosting at home, take cream in a big bowl and add melted butter to it. Now take another bowl, bigger in size, filled with ice and place the cream filled bowl over it. With help of an electric blender, whip the cream for 3 to 4 minutes. Add icing sugar as well and whisk for 3 to 4 more minutes. Add vanilla essence as well and whip again. Just keep note that while whipping the cream should be really cold. Spread some cream over the cake stand and place the cake over it. This is done so that cakes separated easily from it. For making a layered cake, divide the cake into three equal parts with help of a flat and long knife (you can also use two separate cakes for making the layered cake). Add 6 tsp water in honey and make a batter (if you don't want to use honey, then you can replace the use with sugar. For this dissolve sugar in water to make a batter). Place one part of cake over the stand and brush some honey water on it. This make the cake soft. Now place some cream over it and spread it evenly all around the cake. Now take the second part and place it over the cream layered part. Brush it with the honey water, place some cream over it and spread evenly. Now place the third cake part as well and again, brush it with honey water and then spread some over it as well. Place four pieces of butter paper below the cake all around. With this the cake can be lifted easily. Now apply the cream all around the cake. Spread the cream all the cake, covering all the side and making it smooth. Take the chocolate compound and with help of a peeler make chocolate shaves from the half chocolate. Melt the rest chocolate. Add melted chocolate in the cream and mix well. Place this cream in a polythene bag with flower nozzle fitted to the bottom and make small flowers all over the cake. Sprinkle some crushed chocolate between these flowers. Also, sprinkle some crushed chocolate all over the cake. Remove the butter paper from all sides. Chocolate layered black forest cake is ready, take it off from the stand very gently and carefully and place over a plate. The cake looks beautiful. Place this tempting cake in refrigerator for 3 to 4 days and relish eating. Try working under Air conditioner or at a cool place while frosting as the cream can melt if you work at a warm place and then it gets difficult to do the frosting. Even after whipping the cream it doesn't get dense in consistency then place it in refrigerator for 1 to 2 hours and whip again. You can even add cocoa powder to the whipped cream for giving in a color instead of melted chocolate.